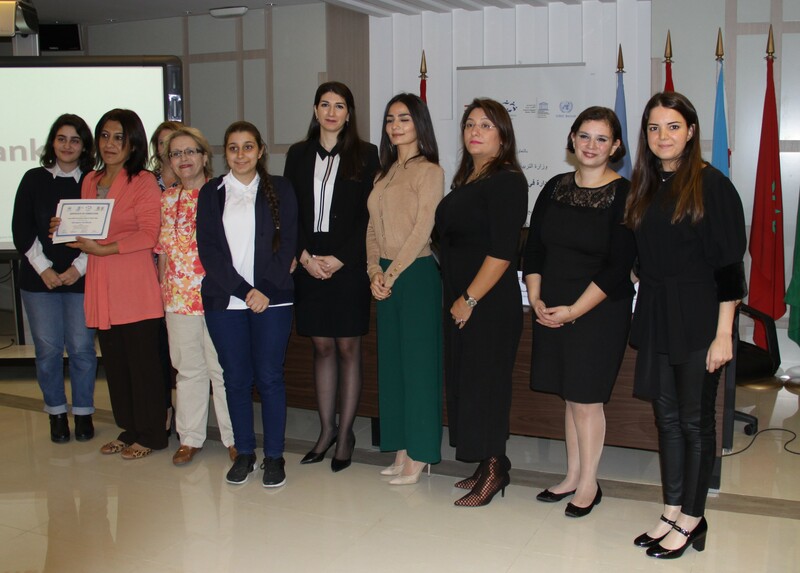 On the 19th of November, 2018, the Certification Ceremony was held for the “UN Aware” program in its second year. The project was an outreach initiative by UNIC, UNESCO and the World Youth Alliance aimed at providing a comprehensive training to future leaders that include practical examples and hands-on training on how international priorities at the United Nations are shaped and developed. From the World Youth Alliance Middle East, Regional Director of Operations Dima Khalifeh presented the activities conducted by all of the schools and their respective Sustainable Development Goals. She gave a brief about the project and the outcomes. Ms. Mary Joe Alavalas, the Regional Director, gave a speech on Youth Involvement and the project, quoting Prof. Charles Malik in Man in the Struggle for Peace. The initiative consisted of three main elements: training sessions, awareness campaigns, and fundraising campaigns, all revolving around the United Nations Charter, the role and purpose of non-governmental organizations, and United Nations’ work and priorities. Organizing 1 conference tackling one SDG with the participation of UN Officials and NGOs. In terms of information diffused, this project was highly informative for students who have heard little about the United Nations, the Sustainable Development Goals(SDGs), Human Dignity, and the World Youth Alliance. It certainly made the students more aware of the work that the United Nations and its partners do as well as the importance of the Sustainable Development Goals and the importance of their collective presence in trying to make the world a better place. According to the percentages of completion of the aforementioned requirements, several schools were awarded the “UN Aware” Certificate with this year in particular having public schools only. The World Youth Alliance Middle East team was responsible for monitoring and evaluation, giving lectures on Human Dignity in the participating schools and reporting on the progress of schools.